In this lesson, we will learn how to write the equation of a line perpendicular to a given line if we know a point on the line and the equation of the given line. Find, in slope-intercept form, the equation of the line perpendicular to 𝑦 = 2 𝑥 − 4 that passes through the point 𝐴 ( 3 , − 3 ) . 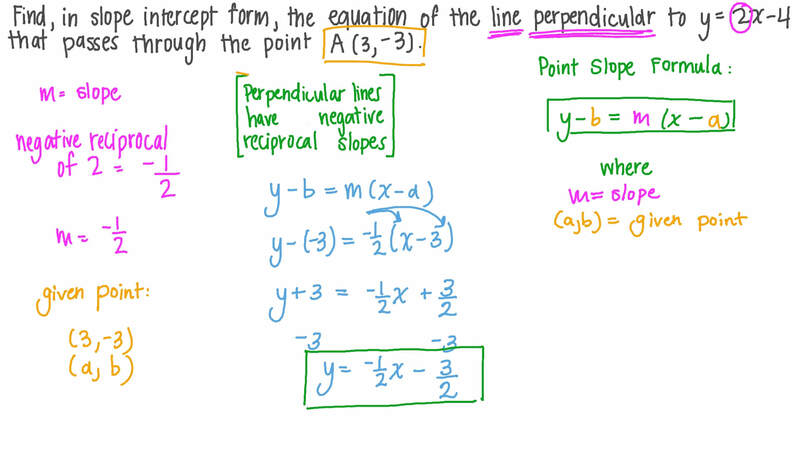 Find, in slope-intercept form, the equation of the line perpendicular to 𝑦 = − 2 𝑥 + 3 that passes through the point 𝐴 ( 3 , 3 ) . Find, in slope-intercept form, the equation of the line perpendicular to 𝑦 = 2 𝑥 + 2 that passes through the point 𝐴 ( − 5 , 1 ) . Find, in slope-intercept form, the equation of the line perpendicular to 𝑦 = 9 𝑥 + 4 that passes through the point 𝐴 ( − 1 , 4 ) . Find, in slope-intercept form, the equation of the line perpendicular to 𝑦 = − 4 𝑥 + 2 that passes through the point 𝐴 ( − 3 , 3 ) .